Can Tyler Larsen follow suit? Jim Langer, Dwight Stephenson, and now Mike Pouncey. The Miami Dolphins have made it look easy finding centers who not only are solid players in the NFL, but All Pro players and Hall of Fame performers. Tyler Larsen has his work cut out for him. While making the Miami Dolphins roster might be a bit easier, given consideration to the issues this team had last season with its starting five and depth, Larsen is still in a position of being on the outside looking in. Larsen saw this happen with his brother, Cody, when he took the same approach in the same position – and is now a member of the Baltimore Ravens. The Dolphins used the offseason to shore up on starters and depth through free agency and then the Draft last week. Larsen wasn't drafted in the seven round pool of players, allowing the Dolphins to invite him to minicamp. Now, as a rookie going through the general mechanics of the offseason process, it seems like he could still make an impact on the team and the roster. Larsen was nothing short of dominant at Utah State, earning first-team all-conference honors the last three seasons — twice in the WAC and once in the Mountain West after the Aggies switched conferences. He even earned second-team All-American honors from USA Today last year and was one of six finalists for the Rimington Trophy, given to the top center in college football. 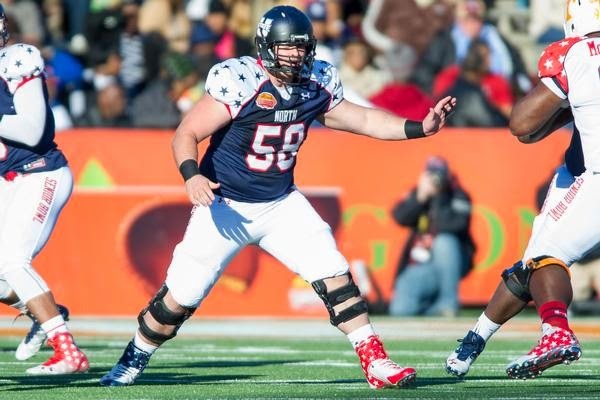 He then turned in an impressive performance at the Senior Bowl, where he was one of the rare interior offensive linemen who wasn’t dominated in practice by defensive tackle Aaron Donald, the eventual 13th overall selection in the 2014 draft. Hopefully he can be just as aggressive in practice, training camp and eventually, a regular season game.